PT. Jaktour and PT. Jakarta Utilitas Propertindo have signed Memorandum of Understanding (MoU) about parking lot management at PT. Jakarta Utilitas Propertindo office, Jl Thamrin Boulevard, Tanah Abang, Central Jakarta.
" MoU signing is one of our ways in giving solution related to each BUMD assets"
PT. 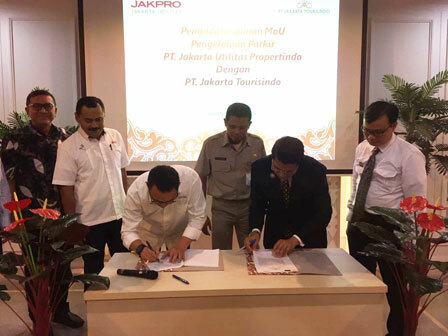 Jaktour Director, Jeffrey Rantung said, this is done as the follow up of Jakarta Governor and Vice Governor referral related to cooperation between BUMDs. "Besides, MoU signing is one of our ways in giving solution related to each BUMD assets," he added, Monday (4/16). PT. Jakarta Utilitas Propertindo Director, Chairul Hakim said, PT. Jaktour parking lot will be changed according to MoU. For example, this parking lot will use e-Money and there is openness between two parties. "With this parking system, Jakarta tax revenue will be increased since it is directly connected with Jakarta taxation system," he stated.